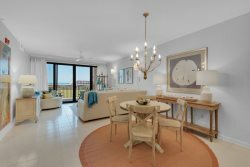 Brand New on Rental Market 4BR/3BA Direct Beach Front Sleeps 13 - New Decor and Upgrades! We are excited to welcome our newest property to the vacation rental market right on Pensacola Beach. We mean, direct beach front house! This house is a 4BR/3BA house with many recent renovations, to include the following: new exterior paint, new stairwell, new beach front deck, new interior paint, new interior decor, and various other upgrades. This house has a great floor plan with a cathedral great room which is wide open and looking directly at the Gulf of Mexico. The bedroom layout is fantastic as well, with 4BRs, 3 bedrooms with king beds, one bedroom with two queen beds, living room queen sleeper sofa and a twin sleeper sofa to comfortably sleep 13. Two of the bedrooms with king beds are Gulf front bedrooms! If you have been waiting for just the right affordable beach front house, this is it! This will sell out quickly for 2019 and some dates are already gone. Please take a look at all of the great pictures and be sure to reserve quickly before your dates are gone.